More Thoughts on the Personal Essay: To Write or Not to Write? Looking over the landscape of personal essays can be a daunting adventure. It's a given that the minute one begins to write in the first person, one begins to lie. Not on purpose perhaps, but out of the unavoidable malleability of time and memory and ego. It's interesting that memoir has become the newest genre of best sellers. 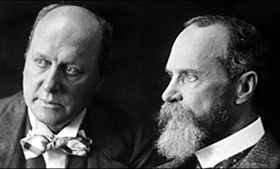 A recent essay (by Adam Gopnik) in The New Yorker discusses Henry James's memoirs that take off from a false position, if viewed in one way, because they declare that they're about his older, more vaunted brother, William James. Even using William as the excuse for the reminiscences and analyses, Henry reveals himself. The act of creative writing is an invitation not only to make something pleasurable, instructive, entertaining, even artistic, it's often a trap to capture what the author might often most like to keep to him or herself. Imagine a book or even story that you remember, and you know you have gained some part of an image of the hand that fiction and poetry will reveal the most, doubtless, but almost as slippery are reports of facts. Information revealed includes choices made by the reporter on what to publish and what to keep back, or what is important and what is of no worth. Consider the variety of interpretations of the same incidents and interviews among the journalists who pass on the news. Imagine Fox and The New York Times printing interchangeable versions of anything they choose to report. Samuel Pepys, Marcel Proust, or Mark Twain could hardly have written more divergent essays called 'diaries,' (Eve's Diary and Adam's Diary in the case of Mark Twain), A la recherche de temps perdus from M. Proust, yet a reader is treated to clear revelations in each case. What is revealed feels as accurate as it could have been when considered in terms of the milieu in which the composition was written, even if it is not all we now know. I believe I was rather a curious child. Now that I’m in my eighth decade, it seems to me that I have hundreds more questions than I did when I was young. Even allowing for all the facts and means of coping that no child is born knowing, now that most of those concerns no longer occupy my mind in the same way, half my waking hours are taken up wondering, Where’s that wisdom that just still being here is supposed to confer? Too many of those questions seem to spring out of the past and its list of things done and things left undone, in the wording of The Book of Common Prayer. I'm not talking about 'what ifs.' I'm afraid what I mean has more to do with how I might do or react to things at a different stage of my life than the one I'd reached when it became necessary to meet crises and puzzles and ecstasy head-on. How much did I fail at or forget or not allow to sink in just because I hadn't had enough experience to see in three dimensions, or know how to judge perspective? Now that I've developed a kind of habit of rendering into words what swirls around so relentlessly inside my head, I come up against another big question — Namely: if I put the time and effort into expressing all this, what's the point? I've discovered one thing that puts me at odds with what used to be the establishment of writing instructors: to write what you know, to write for yourself. I know now that there's no joy in doing all that work for oneself. A writer doesn't write, darn it, for him or herself; that labor goes to satisfy a reader, or more accurately, multiple readers. Maybe we don't expect to make a living at it, much less get rich doing it, but we bother in the hope that there will be a few minds elsewhere that might crack open far enough to let us in, and if they do, that they may enjoy themselves or learn something from what that poor benighted scribe tapped out on a keyboard. The ultimate dream reward is to elicit a response. The list of people who have spent even brief lifetimes entertaining and enlightening everyone who could read is formidable and inspiring. One of these nagging questions of mine has to do with whether someone with virtually no credentials other than ordinary living has any business taking up a pose that might make someone think competition is a motive. Honestly, most of us know our limitations and respect the expertise of legions. A conversation with one of my college-age grandchildren gives me pause. I learned the meaning of 'hubris' even before I was in college, and am too often reminded of it now. How did those young people get so smart so early? I can’t accept that it’s my own fault that I was apparently so slow off the mark. ...Which leads to the question of whether the personal essay and/or memoir might have anything to offer a reader who is either younger than the writer or less experienced. Tracy K. Smith, the New Poet Laureate: "Her work travels the world and takes on its voices; brings history and memory to life"